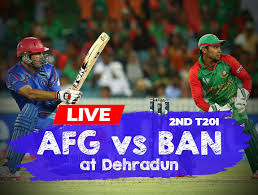 Afghanistan vs Bangladesh 2nd t20 has been played in Rajeev Gandhi International Cricket Stadium Dehradun Uttarakhand on 5th May 2018. In the first t20, Afghanistan defeated Bangladesh so his level of confidence is high. Rasid Khan is in tremendous form. Let see what tragedy will come in this match. M Shahjad(WK), Usman Ghani, Asghar Stanikzai (c), N Zadran, M Nabi, S Shenwari, S Shafiq, K Janat, Rashid Khan, M Ur Rahman, S Zadran. Bangladesh won the toss and opt to bat first. Tamim Iqbal played good for Bangladesh and scored 43 of 48 with 5 4s. M Rahim 22, A H Rony 21, Mahmudullah 14 and S Rahman scored 13 runs. Rasid Khan gave his best and got 4 wickets for 12 runs. M Nabi got 2 wickets. S Zadran and K Janet got the 1-1 wicket. Bangladesh scored 134/8 in 20 overs. Afghanistan's batsman bated very well and achieved winning target in 18.5 overs. In last 2 overs needed 20 runs to win but scored this 20 runs in only 5 delivery and won the match by 6 wickets. Shahjad 24, U Ghani 21, Nabi 31 of 15 3 4s and 2 sixes, and Shenwari played a great inning of 49 with 2 4s and 3 6s. Afghanistan scored 135/4 in 18.5 overs and won the match by 6 wickets.